Wed 04.27.11 – Many thoughts have crowded into my head today and then fled just as fast as the miasma of jetlag has descended on my brain. 1) I really do want to get back to daily photo and/or text blogging. I want to reinstate the multiple year daily blogging that got disrupted in February. One of the things I thought about while in London, is how much I do love blogging and that this is my place. It is time to reclaim it. Please encourage me. 2) The complete disconnect in big big big companies between the executives and the teams that actually do the work astounds me. Last week in London, I heard a true account of one Big Company Making a Big Contract with another Big Tech Company of which it is due to be executed contractually by this June, yet the Big Company to do the work decided to lay off the workers to do the work a few months ago and then when the executives realized that without the workers that the work wouldn’t get done and they would be in breach of contract, much LOLs followed. Ha ha ha. F*cking Executive Idiots. Ha ha ha. 3) So Nokia + MicroSquash deal got signed in the workers’ blood this last week. Hope the 7,000 employees that are to be laid off aren’t the workers who are to actually do the work to make the contract happen, like in tidbit #2 above. Wouldn’t that be LOLs? 4) If a certain Mr. Elop is to wield the hatchet, hopefully he will lay off the multiple layers management between him and the teams that do the work. Wouldn’t it be big time LOLs if he keeps all the management that have throttled innovation & execution the last five years and lays off the teams that actually do the work? 5) In between bouts of jetlag brain, I did a big spring clean of my house and found the Angry Bird furry slingshot toy that Adrian Parker won for me at CTIA. Adrian, I will mail it you tomorrow. 6) Glad to hear that folks are rescuing Delicious from a certain death by starvation, hope that some passionate social photographers with $$$ will rescue Flickr from Yahoo neglect. 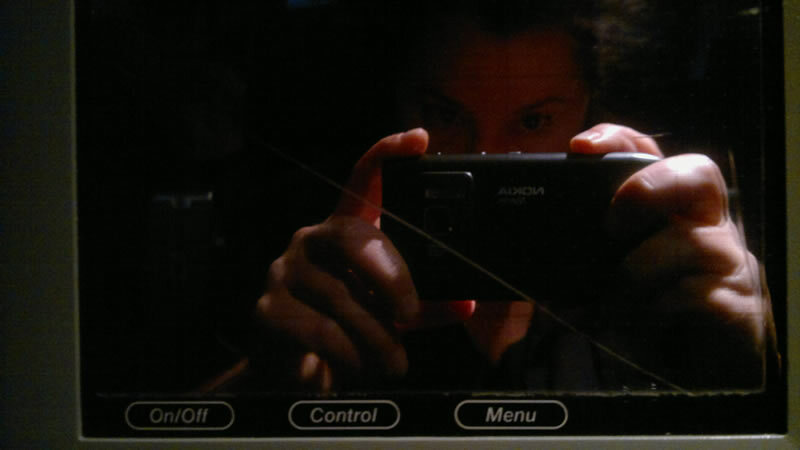 Photo of Ms. Jen reflected in the seat back entertainment screen in hour ten of the plane ride between London and Los Angeles on Tues 04.26.11 with her Nokia N8. by Ms. Jen on Wed April 27, 2011 | Permalink | moleskine to mobile, tidbits.